"Office pie" is the kind of pie that you eat in an office. Don't worry; you won't actually do much work here. You will have a checklist, though. A playthrough will probably take about 20-30 minutes to complete, once it's all finished. 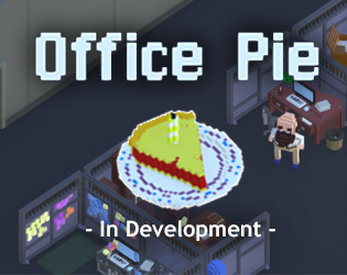 It's tough to talk about the plans for Office Pie without spoiling the fun, so instead we're just going to be sharing some early builds - up until the point when we reach spoiler territory. We plan to release the game on itch.io for a few dollars, and then possibly take it to Steam later. See the Devblog here or on Tigsource. In this build, you can run around and interact with a few objects (the NPCs can do the same stuff that you can do). Only some objects are interactive (couches, vending machines, coffee cabinet, and the chair at the workspace with the little plant on the desk), but we'll be adding more over time. Press tab to toggle slo-mo, if you want to see the character movement in detail (or if you have "Still D.R.E." playing in another tab).